Last Thursday marked the 25th anniversary of the release of Dragon Quest for the Famicom in Japan. This auspicious occasion would have passed by without my knowledge if not for another website giving the event some fairly substantial coverage. This coverage inspired me to take a long-hard look at my appreciation for the Dragon Quest series. In spite of the fact that I really enjoy the games, I’ve never gotten around to playing the earlier entries in the series. Obviously, this particular lapse in judgment qualifies as an extreme mistake. Rectification—that’s right, rectification—was in order. So I decided to play that game was not only the first in what has become one of my favorite video game franchises but is arguably the proto-typical Japanese role-playing game: Dragon Quest I, or Dragon Warrior I as it was titled for its North American release. However, before I could play the game, I needed to decide which version of the game I would play through. The easiest version to throw out of the competition is the original North American relase of Dragon Warrior. Even at the time of its release in 1989, the game was far from impressive in terms of audio and visual presentation, and I find that NES games don’t age very well. 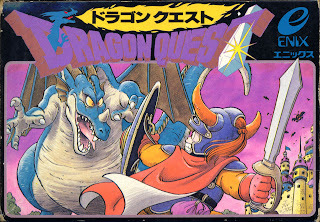 Next up, the Dragon Quest I & II remake for Super Famicom. This was released in Japan in 1993 and features the necessary updates to graphics and sound that make the game playable for me, but this version was never officially localized for stateside release. However, an English fan-translation was made available several years ago, likely making this the best version of the game for anyone unafraid of emulating vintage games. Then there is the GameBoy Color edition of Dragon Warrior I & II, which was released in North America in 2000. Though this features many of the improvements of the Super Famicom version, my one complaint with this release is that the map is zoomed in slightly because of the relatively limited resolution of the GameBoy Color. At first, I thought this to be a very minor issue, but it becomes an annoyance when you can’t view as much of your surroundings while trying to navigate dungeons. This version also has the amount of gold and experience gained from battles slightly increased, which in turn increases the pacing of the game… although the purists may view the game as too simple. My decision ultimately came down to context. The first 3 games in the Dragon Quest series are loosely related, and I want to be able to experience this trilogy-of-sorts in the most consistent way possible. The most sensible option seemed to be to play the GameBoy Color release of Dragon Warrior I & II and later Dragon Warrior III (also released for GameBoy Color in the US a few months after), both of which feature an official retranslation. I was willing to sacrifice a little of the fidelity of the Super Famicom version in order to enjoy the the official versions of these games. So over the long holiday weekend I played through Dragon Warrior I, stealing moments of childish bliss amongst the myriad of celebratory events. My verdict is that Dragon Warrior I is a fantastic experience that was saved from becoming the video game equivalent of a geriatric patient by being simplified. The original release of the game wouldn’t be particularly enjoyable in a modern context. This has something to do with the fact that the correlation between difficulty and reward is much less appealing in Dragon Warrior I than in its great-grandchildren. In retrospect, the simplicity of Dragon Warrior I is a thing of beauty, especially when compared to the increasingly convoluted JRPGs that we see these days. You are one hero (the descendant of the legendary Loto… or Erdrick depending on the translation) on a quest to save the princess from the evil Dragon Lord. Although I didn’t always know what to do next, this single object offers the freedom to explore the vast world of progressively stronger enemies in whatever way I wanted. This simplicity makes Dragon Warrior I a must-play for anyone who loves a classic JRPG. Play it if you can. It's quite good.